Seismometers are instruments that measure the seismic waves generated by earthquakes, volcanic eruptions, and other seismic sources. Globally, development of efficient and advanced technology, rising demand from inexpensive and durable seismometers, growing number of earthquakes, increasing government initiatives, growing focus of geophysical research, and advantageous properties of seismometers are the prime growth drivers of the seismometers market. In addition, an increase in adoption of seismometers for application in newer industrial vertical, and emerging economies such as China, India and others, will create new opportunities for the seismometers market. However, higher cost of research and development, and growing market of counterfeit seismometers are the key restraints for the seismometers market. Geographically, Asia Pacific dominated the seismometers market, followed by North America. Asia Pacific is projected to have the fastest growth, owing to a rapidly increasing geophysical research projects, rise in industrial sector, and growing government initiatives in developing nations such as China, and India in this region. 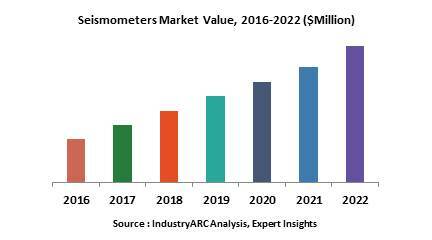 Among all the types, teleseismometers has the highest market share in the seismometers market, since it can record a very broad range of frequencies. Digital seismometer is the market leader among all outputs of seismometers, owing to its better performance and user friendly properties. This report identifies the seismometers market size for the years 2014-2016, and forecast of the same till the year 2022. It also highlights the market drivers, restraints, growth indicators, challenges, and other key aspects with respect to the seismometers market.